A student said to me yesterday, “I believe in signs.” You know those sweet acts of synchronicity where you feel destiny’s breeze gently guiding you towards your next meant-to-be moment? I remember that’s how I felt back in May 2006, when I was inspired to visit the land of Mayan Moon Goddess Ixchel in Southern Belize. I didn’t know it then but Ixchel was a beloved Goddess of the moon and women’s wombs. I think she actually led me there unbeknownst to me at the time. When I returned to Toronto I went back to Yoga School to compliment my 2 year Yoga Teacher Training with further studies in Women’s Health. I studied pre and post-natal yoga but I was particularly curious about women’s cycles and their relationship with the moon. As I studied on, I was both haunted and awed by the words I read in Christiane Northrup’s book, Women’s Bodies, Women’s Wisdom. She talked about how women’s energy is cyclical in nature, not linear like men’s energy. She said we have a natural and innate connection to the phases of the moon, the rhythms of the earth and the flow of the tides. That in fact our menstrual cycles reflect all these aspects of nature within us as we ebb and flow through the waxing and waning energies of pre-ovulation, ovulation, pre-menstruation, and menstruation. I was stunned – why had I never, ever heard of this before? Why did no woman I asked have any clue about this beautiful and mystical information? Then I understood. This was why the name Yoga Goddess had chosen me. It was the work of the Goddess, the archetypal feminine that I was here to do. Want to learn more? Good! Because I’m thrilled to announce on September 21st, we’re celebrating the Fall Equinox with a live Moon Goddess 1-day retreat in Toronto. And when you register before Sept. 6th you qualify for early-goddess savings. Heads-up goddesses, if you have painful or missing periods, concerns about fertility or if you’re getting close to menopause this class will be especially meaningful for you. 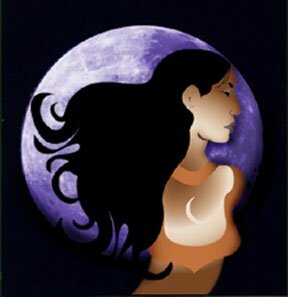 >>Read more about the upcoming Equinox Moon Goddess at Kula Yoga in the Annex. You can access Moon Goddess on line and complete the 5-week journey from the comforting surroundings of your own home. Did you enjoy this article? If you did please ‘like’ it and share my story with all the women in your life . It is true, signs are a powerful message! Not many people allow “signs” to enter their conscious. Your story was inspiring and it was wonderful to hear about your passion for women’s health. Universe’ that we’re on the right track. Like you writing on the blog 🙂 I’d love to hear back from you!